Despite black masks and anti-police slogans, Saturday night’s anti-police brutality protest was largely calm and peaceful, with no major confrontations between police and protesters. Responding to calls on social media, around 130 people gathered in place Émilie-Gamelin at 8:30 p.m. to protest what they saw as unjust actions by the Service de la Police de la Ville de Montréal during this spring’s many demonstrations. “Down with the SPVM. Down with the Police,” said the event’s Facebook page, which cited the dismissal of complaints against the SPVM as one of the reasons for the march. 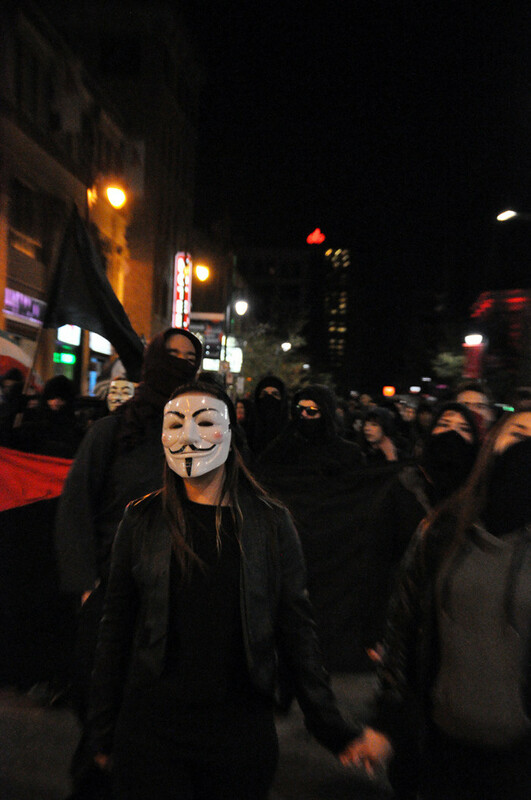 Led by a black flag, the protesters left the square around 9 pm, and marched west on Ste. Catherine St., where they continued until they reached Atwater St., were directed north, and returned eastward on Sherbrooke St. Intermittent fireworks being set off by protesters and the moving of traffic cones into the path of cavalry police constituted the only notable disturbances. Two officers from the SPVM’s mediation team accompanied the protest. 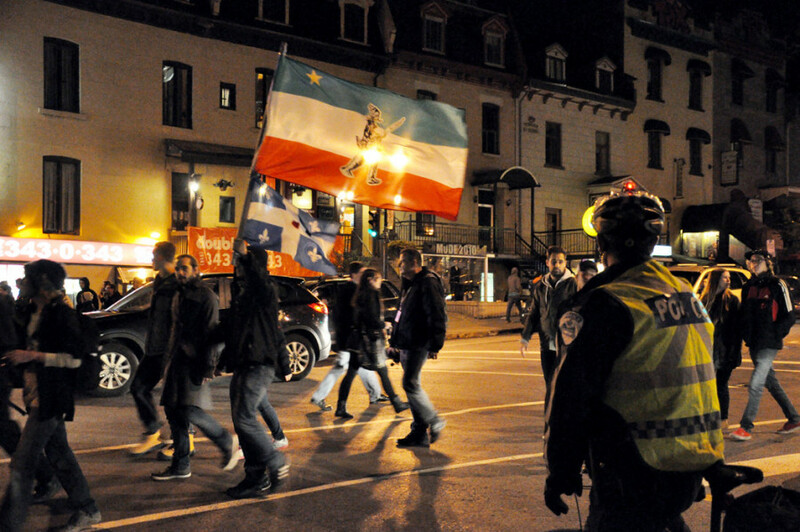 The SPVM declared the march illegal as it passed University St. on Sherbrooke, and was dispersed southward on Jeanne-Mance. Confusion ensued as around 20 riot police, who had accompanied the protest since it set off, stayed in close proximity to the dwindling group of protesters, who were standing in groups on the street’s sidewalks. A small number then regrouped and marched east on President Kennedy and Ontario, then south on St. Dennis. The SPVM announced that the protest had resulted in no arrests, although one person had received a ticket for violating a municipal bylaw.